My congregation, First Parish Cambridge, Unitarian Universalist, had an amazing service yesterday that focused on Haiti and on standing with immigrant families here in the United States. Community partners from the Haitian Coalition were in attendance. We collected Valentine’s Day cards made by UU Mass Action to send to our legislators for Comprehensive Immigration Reform. People signed up to participate in Temporary Protected Status Legal clinics sponsored by theUUA & UUSC and partners. People also signed up to go as a congregation for a Walk for Haiti in March sponsored by the Haitian Coalition that will raise funds to rebuild schools in Haiti. The religious education classes made valentines for Partners in Health and read Circles of Hope – a story about Haiti. The youth group sold t-shirts for the walk (1/2 the sales go to Partners in Health or you got a free t-shirt if you promised to get sponsors for your walk). Rev. Fred Small preached a truly amazing sermon on Haiti – managing to give ‘a people’s history of Haiti’ in the context of worship and rousing folks to love and action. Truly standing on the side of love. We sang “Stand” by Amy Carol Webb in the worship service, the choir sang a Haitian ballad, and the congregation sang a calypso Alleluia. At the end of the service after eveyone had a chance to eat Haitian cake in the parlor, speak with our guests (a number of people from the Haitian community came to the service as well as the folks who work at the Coalition) and sign up for the TPS legal clinics and the walk (along with turnng in cards for CIR) – we all went out on to the front steps of the church – holding the Standing on the Side of Love Banner – and singing ‘Stand’ with Rev. Small playing guitar and singing the verses. The moment was magical, folks were filled with love, and passersby stopped to listen and cheer us on. We’re now thinking we could do this once a month around various standing on the side of love justice issues as a form of public witness. Just when you think things couldn’t get worse in New Orleans, and when federal legislation for recovery in the Gulf Coast has finally been introduced, FEMA announces trailer evictions. Please read the post below from the Katrina Information Network. And if you haven’t already, please urge your Representative to co-sponsor the Gulf Coast Civic Works Act through the UUA’s online action campaign and/or by collecting signatures from your congregation to mail to your Representative. FEMA has announced that tomorrow, on May 30, 2009, it will act to evict thousands of residents from FEMA trailers in the Gulf States in spite of the fact that these residents have had limited support and lots of barriers in their efforts to find permanent housing. Please act now to stop this travesty. Mr. Ernest Hammond is a case in point. Hammond, a 70 year old, former New Orleans homeowner, could not get financial help from Louisiana’s Road Home program for his triplex since the housing structure was ineligible for a grant. To help himself, Mr. Hammond has collected almost $10,000 in aluminum cans but that won’t even begin to cover the costs to rebuild his home in the 7th Ward. His FEMA trailer is keeping him off the street while he struggles to return home. Mr. Hammond is one of thousands of families living in FEMA trailers because they are either caught in a web of deeply flawed, bureaucratic home repair grant programs, a victim of all too rampant contractor fraud or simply priced out of a rising rental markets where affordable housing is being demolished or gentrified. No one chooses to live in a FEMA trailer, but it is better than no home at all. Evicting residents without providing access to safe, permanent housing will only lead to homelessness and further destabilize families. Please take a minute to click and send an email or make a call to let the Administration know that evictions are a bad idea. 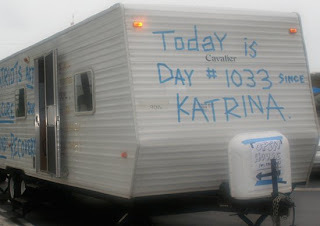 Tell President Obama and Congress to extend the May 30th FEMA trailer program deadline! 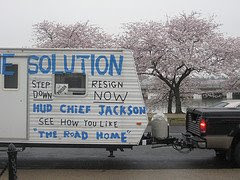 Say NO to FEMA’s decision to forcibly evict residents from trailers! Most FEMA trailer occupants are elderly and/or disabled persons in desperate need of effective support and case management services to stabilize their housing and wellbeing. FEMA trailer occupants are displaced homeowners and renters still struggling to rebuild their homes or secure affordable housing after Katrina and Rita. Hold our elected leaders to their promise of Gulf Region recovery, and de mand equal protection under the same human rights policy that the U.S. government applies to displaced persons in other countries. 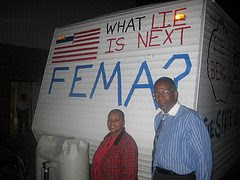 Tell FEMA to provide an extension to all homeowners and renters living in FEMA trailers to allow them sufficient time to repair their homes and/or find alternative housing. Louisiana homeowners to appeal denials of Road Home grants, or go to a Road Home closing. Mississippi homeowners to be matched with available Katrina cottages that sit idle. Renters more time to obtain rental assistance or other permanent affordable housing. Call the Obama Administration and FEMA to demand action now! Tell our government not to carry forward yesterday’s short-sighted policies and to apply the same human rights standards to displaced persons in the Gulf States. Demand a stop to the FEMA trailer deadline and the guarantee of safe, permanent housing in the Gulf Region. Anti-Racism and Organizing: An Unstoppable Force for Change! Susan Leslie is the Director of the UUA Office for Congregational Advocacy & Witness. I’m just back from the UU Allies for Racial Equity Conference at All Souls UU Church in Kansas City MO, held on March 13-15th. I feel profoundly grateful for the opportunity to gather with other white allies and ground myself in an understanding of what Rev. Rebecca Parker refers to in Soul Work as my social location. To continue to cultivate an awareness of how my white middle-class position affects my worldview, my assumptions, and the ways I interact in multi-racial coalitions and organizations. I had the privilege to be invited to speak on a panel at the All Souls Forum on March 15th on the topic of Post Racial America? Several people asked that I post my remarks from the Forum and so I have below. Does the election of President Obama mean that we’ve entered a post-racial era? NO. Not yet. My understanding is that we can’t say or claim that until we have eliminated all systemic inequities based on race. And that will be not only through eliminating policies that create inequity but by redressing existing inequities through pro-active measures to create equality such as reparations. That’s going to come from a persistent effort of addressing this through government policies, the private sector, civic society – which includes us in the religious community — and changing individual attitudes and behaviors. To claim that we are already a post-racial society is to miss the real significance and opportunity of this moment. However, whether we are or not is not really the most important question right now. What’s crucial is to grasp that there has been a sea-change – that’s been a long time coming – and the moment is here to make huge strides in dismantling racism and oppression. A new multicultural, multiracial coalition came into being that elected President Obama – a coalition of African American, Latino, whites and others – that became possible through the growth and political activation of communities of color and because enough whites have shifted in attitudes and political understandings. This past December, I had the privilege to attend a gathering of 3,000 people from congregation-based community organizations, labor unions, and advocacy groups who came from all over the country to meet with President Obama’s Team and key congressional leaders. It was called Realizing the Promise. It was absolutely the most diverse gathering I have ever attended in terms of race, ethnicity, region, faith, class, and age. It was amazing! We now have the opportunity to bring our visions and to make our voices heard in the White House and Congress and in the national conversation. Dismantling racism needs to be done system by system at national policy levels and the local and grassroots level. The new coalition that has emerged understands that we are all interconnected and that sound policy must reflect that. To eliminate racism and oppression – to create equality – we need health care for all, more resources for schools that serve communities of color and low-income families; tax policies that DO redistribute income; immigration reform that keeps families together; trade policies that don’t drive people out of their native countries in order to escape extreme poverty; labor laws that protect workers and ensure a living wage; restorative justice not criminal justice; energy policies that create sustainability and jobs and that don’t dump toxins into the most vulnerable communities. We now have a president that understands that the solutions to dismantling institutional oppression are interlocked and that institutional policies need to be changed in every sector – brick by brick. We have a president that models caring, compassion, and accountability, and wants to do that. Our role is to keep lifting up and advocating for that vision, to offer solutions, and to deliver the grassroots (and grasstops), and to do that in a way that is accountable to and in solidarity with historically marginalized communities. That’s our piece of the partnership. What does this partnership look like? It looks like the thousands who went to Phoenix a few weeks ago calling for an investigation into Sheriff Arpaio’s abusive treatment of immigrants. 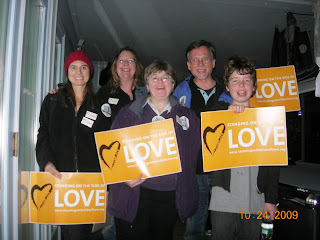 (The UUA and UUs from Arizona were very involved in the organizing and turnout.) And this week the Dept of Justice announced a full investigation and an overhaul of the 287g policies that authorize local enforcement of federal immigration law. We have some power here. That would not have happened 3 months ago! This partnership looks like the passage of SCHIP (State Children’s Health Insurance Program) that just covered 10 million children (including 4 million immigrants – they were not left out) that the PICO National Network organized around the country and that President Obama signed into law — and like the movement now building for universal health care led by Health Care for America Now and others. It looks like the network of educators that our partner Spirit in Action is bringing together to address the inequalities in education and to develop a report and proposal for delivery to the new Secretary of Education. It looks like Van Jones being appointed this week as the administration’s Green Jobs Czar. Hilda Solis, daughter of immigrant union organizers, as Secretary of Labor. Melody Barnes, as Director of the Domestic Policy Council; Valerie Jarrett, White House Senior Advisor and Assistant to the President for Intergovernmental Relations and Public Liaison. Cecelia Muñoz, Senior Vice President of LaRaza’s Advocacy Office appointed as the administration’s Director of Intergovernmental Affairs! We have an organizer in the White House! We have a huge organizing job in front of us now and we have partners in power! To be successful we need to know the rules, we need to understand how systemic racism plays out and operates, and what we have to do to undo it. We need specific solutions and policies that are based on what the people most affected identify as needed, backed by the political power to institutionalize them. Yes there will be struggle –- the socialism charge continues to rear its head –- ugly racial epithets –- and worse, burnings of black churches have occurred. It’s coming from those who feel they’re losing their power. We have to take it on -– we can’t ignore it or give it too much power –- we need to go after it swiftly — be savvy and contain it. But to be alive and awake right now is to really grasp that we have an opportunity to transform society in a way that hasn’t existed for the past 40 years. So– post-racial society? Not yet –- but I’m betting that a post-racial United States may be where my potential future grandchildren live. I’m proud to say that the Unitarian Universalist Association of Congregations was the first religious denomination to call for an end to the raids and deportations that are tearing families apart causing fear and repression in immigrant communities and sorrow and disruption in all communities where school friends are losing parents, businesses are losing workers, and anti-immigrant sentiment is bolstered. The UUA joined the New Sanctuary Movement in 2007 and passed an Action of Immediate Witness that year to end the raids. Since then the Catholic Conference of Bishops has called for a moratorium on the raids as well. Two coalitions that the UUA works with, Interfaith Worker Justice and Welcoming Massaschusetts, have also called for an end to the raids and unjust deportations. Congregations wishing to take this stand can sign the New Sanctuary Movement Pledge. (Please let me know that you did by writing to sleslie@uua.org — so far 12 congregations have done so). MA congregations can also do so at the Welcoming MA site. Soon, there will be a Welcoming America site that will include CO, GA, ID, MA, NB, NC, NY and TN and other states. The launching conference is in April. For the first time in a long time, it’s looking like a humane and just policy toward immigrants has a likelihood of passing. See our website for more information about the UUA’s advocacy efforts for just immigration reform. Note: In May, the Action of the Month will be on Immigration and this year’s Public Witness at General Assembly in Salt Lake City will be immigrant rights. When I attended my first Let Justice Roll Living Wage Campaign meeting after the 2004 election we were asked to raise our hands if we knew what the federal minimum wage was, and if we knew what the minimum wage was in our state. I was mortified that I did not know but felt slightly better seeing that many of the other denominational advocacy staff did not know either. The people in the room that did know were organizers from ACORN, Jobs with Justice, and the Let Justice Roll Living Wage organizers. In any case, the experience demonstrated sharply for me how those of us doing advocacy work can get pretty out of touch with the realities of poverty and oppression in our country. I mean we know it exists, but start doing the math of living on $6.55/hour and it breaks your heart. Through the UUA’s partnership with the UUSC on the Let Justice Roll Living Wage Campaign, I have learned who low-wage workers really are and what they are facing. Three out of four minimum wage workers are age 21 or older. Two out of three minimum wage workers are women. Most minimum wage workers are women with children. They are healthcare workers, childcare workers, food service workers. People of color and immigrants make up a disproportionate percentage of minimum wage workers. Most minimum wage workers are high school graduates. Many teenagers working in minimum wage jobs are working to save for a college education. The next minimum wage increase of $7.25 in July 2009 (the third and final increment of the legislation passed in 2007) will affect 10% of the workforce nationally, and close to 20% in several states, particularly in the south. It would take a $10.08 minimum wage now to match the buying power of the minimum wage in 1968—four decades ago. UUA President Rev. William Sinkford’s Op Ed about the $10 in 2010 Campaign is inspiring and informative. It was run in several African American weekly newspapers over the Martin Luther King, Jr. holiday and on several progressive websites. See Hope and Change for Low-Wage Workers.